These instructions will show an owner of a resource calendar how to open the resource calendar, share the resource calendar, and change individuals' permissions on the resource calendar. 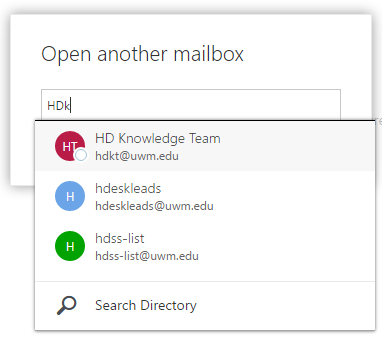 Follow these steps to open a resource calendar as a shared mailbox. 2. In the open another mailbox window, type resource's name (e.g., BOL 210) and click Search Directory (if you've opened this resource before, the name may appear as you type). 3. Select the mailbox you wish to open from the menu. A blank screen with the words "Bad request".